On one of the most historic events in American history, the Dudge Report's top headline is "OBAMA FLUBS THE OATH." Update: ha! 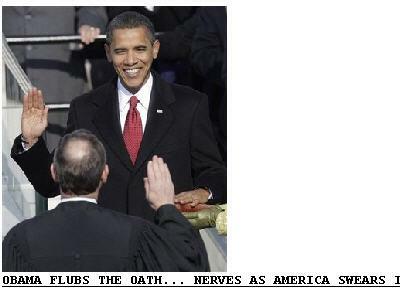 They changed the headline to "OBAMA & CHIEF JUSTICE FLUB OATH OF OFFICE." Well that was nice. And more accurate, considering it was Roberts who prompted him incorrectly, and Roberts only got it right after Obama, who clearly knew it was incorrect, stopped and nodded to Roberts to try again. President Obama's speech was okay. Not terrific -- but okay. Especially in light of his past speeches. My main beef with the technical composition of the speech was that it was discombobulated and lacked a central theme. He has done much better in the past, and I assume will do much better again in the future. "If Barack Obama's reputation as a great orator somehow survives his banal Inaugural Address it will say more about press infatuation with the new president than about his actual speech-making skills. "While Obama sent reassuring signals on his mainstream views on government and markets, as well as the ongoing war on terror, his address amounted to a clumsy, cliche-ridden ramble with no focus or memorable phrases. Consider, for instance, his reference to "duties that we do not grudgingly accept but rather seize gladly, firm in the knowledge that there is nothing so satisfying to the spirit, so defining of our character, than giving our all to a difficult task." This passage amounts to a swamp of incoherence, platitudes and even grammatical mistakes. "The Inauguration may have been a great historical moment but it hardly produced a great speech." This is a fine moment to illustrate the subjectivity of such analysis. That section Medved quoted makes sense to me. I have no clue what Medved is talking about, making Medved's statement a "swamp of incoherence" to me. I also think it was a great speech. Additionally, that Medved would make any statement about incoherency after eight years of the Bush presidency cracks me up. I think his speech sounded like he was trying to sound like everybody else. I'm curious if he's ever written his own speeches, and if not do we really know what little we think we know about the President? And for the record Drudge may be biased at times but every major news media source devours his website. He's broken some really big stories and his site gives good links to stories I'd have never heard about on MSNBC. Many of Obama's speeches were written by 27-year-old Jon Favreau. As for knowing what we know about Obama, I've read his books, which gives some insight into his mind. Everything in his speeches aligns ideologically with what he's written, so I don't think there's any concern about whether or not his speeches accurately portray his character. For that matter, most politicians have speech writers. Heck, even executives in companies have speech writers. As for Drudge... he's not really a news outlet. I mean, he's broken some stories, but he's primarily an aggregator -- all he does it put his own spin on the headline title and link to outside sources. He just happens to collect stories that align with his political viewpoint, and his MONSTROUS following gobbles it up as though it's the only news out there. Well I gobble it up because I also search the other new sites and don't find the stories Drudge posts. He writes articles frequently and they are listed as usual links when he's breaking some stories. I've caught a few non-Fox mainstream news stations with their computers stuck on drudge report in the background. And his political viewpoint is closely aligned with my own so there's that. I read it because it's a convenient way to absorb current political news from the conservative angle. I try to make sure I get a good mix of news, and drudge seems to be the focal point of conservative happenings. I don't really enjoy it, though. But I don't enjoy far-left stuff so much either.